welcome to my new favorite chicken dish. 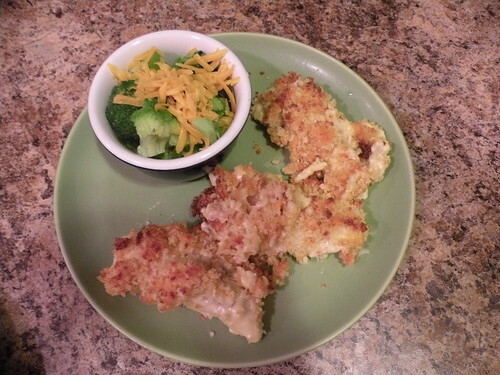 anyways, moving past the crumbs… this dish is down right delicious and is very easy to make. tom kept saying how good it was and he’s pretty picky about dishes involving any sort of creamy substance. so you should definitely give this dish a try! pre-heat oven to 425°. coat a 9×13″ baking dish with shortening. place flour in a gallon-size ziploc bag. season chicken with pepper; add to bag one piece at a time. coat tenderloin in flour, shake off excess flour, remove from the bag and place in the baking dish. repeat. combine soup and mayo using a whisk; spread evenly over the chicken. stir panko and cheese into the softened butter. you may need to use your hands. (this can get messy!) top chicken with cheese mixture. cover dish with aluminum foil, bake 10 min. remove foil. bake 10-15 min. or until top is golden and chicken is throughly cooked. I will definitely try this one. I have wanted to try Panko , too. This sounds easy and delish!